Info: What better way to express your wishes than with chocolate! Our chocolate basket has a bounty of chocolate treats that contains Kit Kat, Cadbury dairy milk, Demolinos, Reese, Lindts, Tango, Mon Cheri by Ferrero. 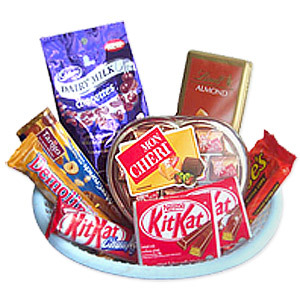 This basket is filled with all the chocoholic's delights that everyone is sure to love.